A place that will gather the chain of production of key sectors for Brazil and Rio de Janeiro’s economy. Events which will discuss the development of the business environment and allow for networking to develop projects and partnerships. A one-year event schedule. That is the ambitious proposal of Casa Rio. Casa Rio will be installed at Porto Maravilha, the largest public-private partnership in Brazil, at Port Corporate Towers, a new Tishman Speyer enterprise. Conferences, discussion panels, roundtables, matchmaking, award ceremonies and cultural actions all can be made in the space, which has over 1.000 square meters. There will circulate investors, financiers, suppliers, entrepreneurs, executives, regulators and authorities, making it the country’s premier reference in networking. 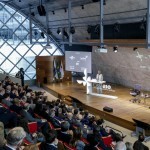 Casa Rio, coordinated by Rio Negócios, will be the stage for over 140 events in 56 weeks of event programming, with discussions on the development of strategic economic sectors – infrasctructure, energy, technology, life sciences, creative industry, financial services and tourism – and the improvement of the country’s business environment. “This is the moment for us to initiate the boldest project ever realized in Brazil. We started this offensive during the London Games and continued during the World Cup, last year. Now we reach a new level. Our projection is to reach over 16.000 professionals in strategic sectors for Brazil and Rio”, declares Marcelo Haddad, president of Rio Negócios. During the London Olympic Games and the 2014 World Cup, the agency held Rio Conferences – sectorial conferences which had participation from 1.400 companies. These actions resulted in eight investment projects for Rio de Janeiro and another six for the country.